The Softball team struggled defensively last night, as the Lady Warriors hosted South Putnam HS, but rallied for a 10-10 tie in eight innings. The game was declared a tie due to darkness. 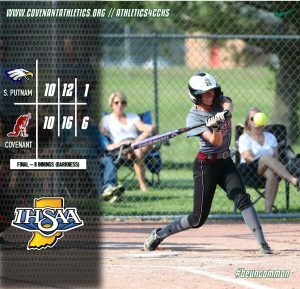 South Putnam pushed the game’s first run across in the top of the first inning, before Covenant responded with two runs in the bottom of the frame, with the first coming on a hit by Senior Sydney Jones. The Lady Eagles then took advantage of some CCHS defensive miscues, building an 8-2 lead after three innings. Covenant then picked up two runs in the fourth, three in the fifth, and two more in the sixth to push the score to 9-9 going to extra innings. The heart of the Lady Warriors batting order did a ton of damage, as Freshman Morgan Yeater, Senior Bailey Everett, and Jones each tallied four hits in the 2-4 spots in the order. Yeater also stole two bags. Sophomore Brooklyn Bond came on to pitch in relief, limiting the Lady Eagles to just two runs over five innings. South Putnam hit a home run in the top of the eighth inning to take a 10-9 lead, but Covenant scored to tie in the bottom of the inning. CCHS loaded the bases with no outs, but three straight strikeouts ended the game. Covenant will be back at home at Wayne Sports Park on Saturday, as they host the Indy Marlins at 10:00 am, followed by a game with Centerville HS at 1:00 pm.